Show me your ways, Lord, teach me your paths. Guide me in your truth and teach me,for you are God my Savior, and my hope is in you all day long. Am I doing something wrong? I cannot get the song to download on my computer. I tried right clicking and there was no option??? 14 Is anyone among you sick? Let them call for the elders of the church, and let them pray over him, anointing him with oil in the name of the Lord. 15 And the pray of faith will save the sick,and the Lord will raise him up. And if he has committed sins, he will be forgiven. Love this song and reminder of an early teaching of Beth Moore’s on Ephesians 1. I have spoken the truths of those verses and the affirmation of God’s affection to young ladies for the last several years. Our identity is so important. I have loved the opportunity to share the truth of who they are. They are going out into a world that tells them everything so opposite from scripture. Praise the Lord, my soul; all my inmost being, praise His holy name. Praise the Lord, my soul, and forgot not all his benefits who forgives all your sins and heals all your diseases, who redeems your life from the pit and crowns you with love and compassion, who satisfies your desires with good things so that your youth is renewed like the eagle’s. I can’t put into words how blessed I was by the teaching and worship in the simulcast. 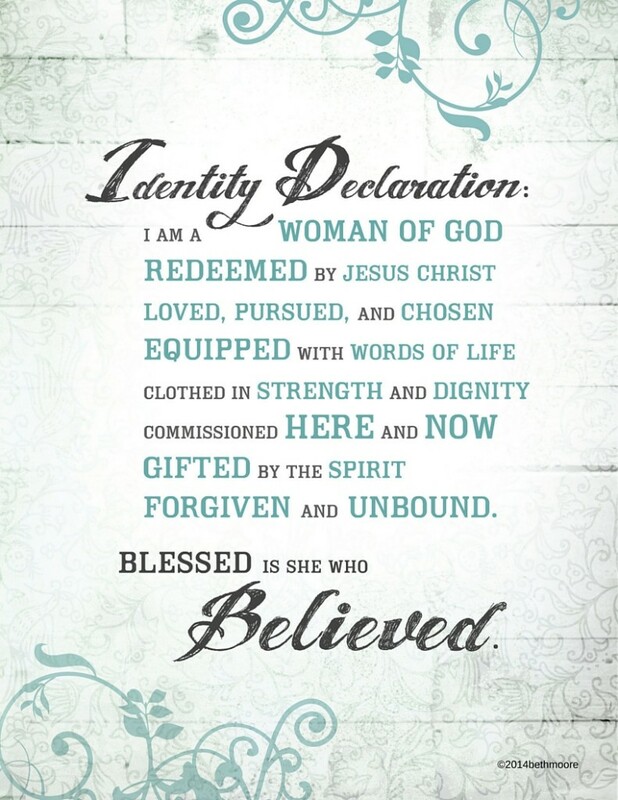 And I am so excited that the Identity Declaration song has been released! Thank you!!! Call to me and I will answer you and tell you great and unsearchable things you do not know.’ Jeremiah 33 v3 First person I wake up to and last person I say good night too I call you Lord Yes Lord Jesus thanks for hearing me always! I’m a few days behind but here’s my 2nd scripture for February! Let us throw off everything that hinders us and the sin that so easily entanges. And let us run with perseverance the race marked out for us. Rosario Kowalski, Springfield Mo. (SSMT main link is currently not operable). My brethren, count it all joy when you fall into various trials, knowing that the testing of your faith produces patience. But let patience have its perfect work, that you may be perfect and complete, lacking nothing. If any of you lacks wisdom, let him ask of God, who gives to all liberally and without reproach, and it will be given to him. (‭James‬ ‭1‬:‭2-5‬ NKJV). Buda Tx NIV May 14 2015 John 14:27 Peace I leave with you, my peace I give you, I do not give as the world gives: Do not let your hearts be troubled, and do not be afraid. I love all your teachings…your a wonderful women of God. Id like to be your friend on facebook as well.